Boat shaped bowl in green to ochre. Gunnar Nylund. Rörstrand. A boat shaped bowl with hare’s fur glaze in green to ochre. Gunnar Nylund for Rörstrand. H/L 5/10 cm (2/3.9 in). 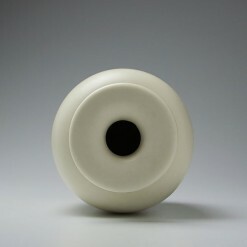 Weight 110 g.
Condition: Very good (a few minimal production related pores in glaze). First quality mark. 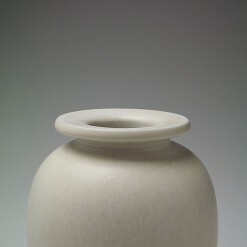 Vase with incised pattern. Gertrud Lönegren. Rörstrand. A bull’s head. Roger Capron. Vallauris. 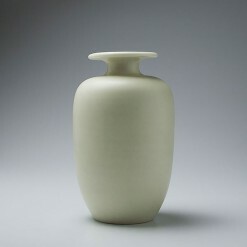 Vase with a white hare’s fur glaze. Gunnar Nylund. Rörstrand. Relief vase. Anna-Lisa Thomson. Upsala Ekeby. 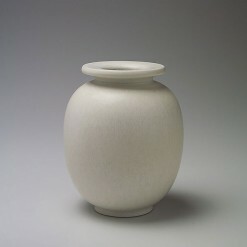 A white vase. Erich & Ingrid Triller. Tobo.